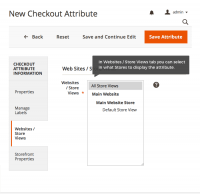 Customize your Magento 2 checkout with extra fields of different types. Gather valuable marketing and client-base data, and use these data to draw conclusions for your business. 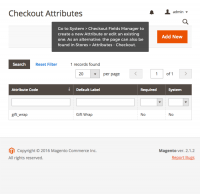 Gather extra data at Magento 2 checkout. Ask your customers any question you want. Add new *required fields to the checkout form. View different segments of customers depending on how they answered. This extension is also available for Magento 1.x.x. 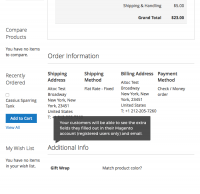 By adding new fields to the basic checkout form, online retailers get the opportunity to collect necessary customer data directly from the owner. Unlike the information coming from any external sources, this data will be highly reliable and relevant. And, what’s even more important, it won’t require significant efforts, both time and money, to be gathered. With trusted customer data at their hands, merchants open up a multitude of opportunities for more effective decisions across different aspects of their business. Information gathered from custom checkout fields can be further analyzed and used as a foundation for new email campaigns, update of pricing and shipping policies, customer segmentation and product positioning, and many others. 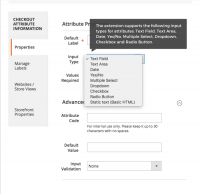 The extension provides a great flexibility in adjusting the checkout form to retailers’ needs. There are multiple editing options available, so it is possible to add new fields in a format that will be the most convenient for customers, as well as indicate the truly required fields. This gives prospects the ability to skip additional questions, if they’d like to, making the overall checkout process easier and faster to complete. 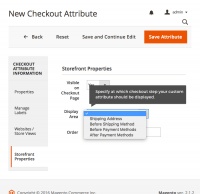 Add custom fields to the checkout page in Magento 2. Pick the input type that works for you: Text Field, Text Area, Date, Yes/No, Multiple Select, Dropdown, Checkbox, Radio Button. Make your custom fields required, if you wish. Show extra fields in specific Store Views (per Website). Show the information from custom fields in Order details (both for the customer and the admin). 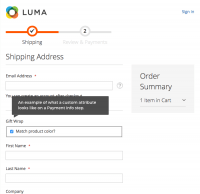 Choose the checkout step at which the field(s) appear (before, after, at shipping / payment method step). Compatible with any payment method. Coming soon! Add custom fields on the registration page in a click. Coming soon! If a customer fills out your registration fields, corresponding checkout fields are automatically pre-filled. Coming soon! Show extra fields to specific Customer Groups. Coming soon! Show extra fields when a specific product is ordered. Coming soon! Show custom fields when products from a specific category is ordered. Add custom fields to the Orders grid (except for the Date field). Filter and sort orders by data in custom fields. Export data from custom fields in the Orders grid to .csv or .xls - along with standard Magento Order export. Export data from selected custom fields matched with Order IDs to .xls. 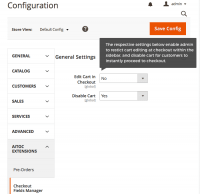 Magento 2 User Roles plugin - Assign specific access rules for different admins and restrict access to certain store areas to ensure only authorized staff members can use the admin panel. Magento 2 Shipping Box plugin - Optimize your packaging and shipping process. Automatically calculate the total weight and dimensions of ordered goods to pack them in boxes in the most cost-saving manner. Magento 2 Inventory Management Suite - Manage multiple warehouses and inventory simultaneously. Split your stock between various web stores and control your inventory levels in the real-time. Magento 2 Force Login module - Enhance the security of your store by enabling a second authentication step. Generate one-time passwords automatically and create a whitelist of IPs. +Added compatibility with Magento Open Source 2.3. + Added compatibility with Magento CE 2.2.0. 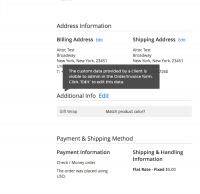 * Fixed a validation issue with ‘purchase order’ payment method. + The extension is compatible with Magento 2.1.3. + The extension is compatible with Magento 2.1.2. Customer service is top notch here! I've had some conflicts between my custom theme and several modules, and they helped me resolve this. Now everything works perfectly together, thank you so much! I love asking my customers small questions and get valuable marketing data out of it. I often ask specific things about particular products and get insights from my buyers. Awesome! The extension is working perfectly well. Found one small issue. Incorrect validation of fields in case of several payment methods is configured. Thank god guys fixed it in a day. Excellent support! Keep it up!